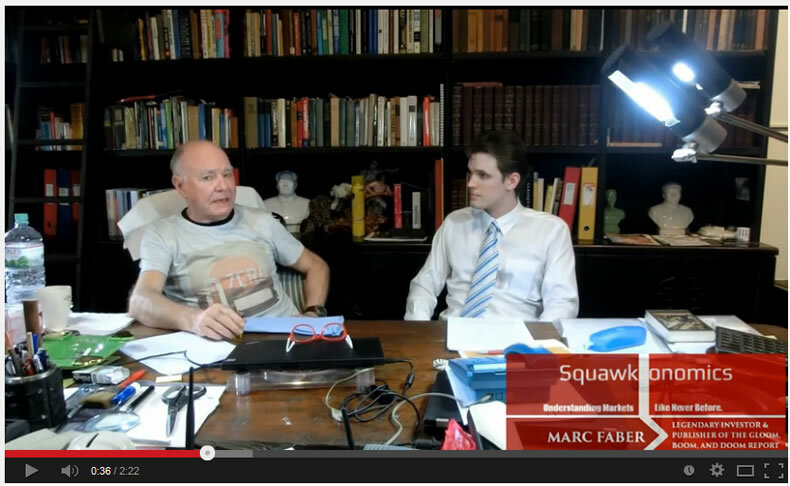 In the latest Squawkonomics interview with Marc Faber, Marc offered insights and direction about the future of the Vietnamese economy. Marc laid out that Vietnamese stocks are essentially in a bottoming out phase, and valuations of Vietnamese equities are looking particularly attractive at this point. Marc also explained to us how Vietnamese have different economic habits unfamiliar to many Western countries such as buying houses with gold outright, and how different metrics are required to understand the value of the Vietnamese economy. Check out the video below for more investment insight from Marc Faber on Vietnam. Marc will be speaking at the upcoming Vietnam Investment Forum in Ho Chi Minh on June 19 to inform investors how to invest in Vietnam and find opportunity and value amid the current South China Sea tensions. For those interested in attending, be sure to contact Vicente Nguyen at support@vietnaminvestmentforum.vn for more information. Vietnam finds itself going through a defining period in its geopolitics as it strives to secure its natural resources at a time the country is emerging from an almost two decade long trade deficit, and just at a crucial period when Vietnam is looking to transform a population base that consists of almost half in the agricultural sector to higher paying professions and productivity for the nation. As more people drop the agricultural trade, both per capita income and electricity usage will increase in the country, which means that securing natural resources for a population that is poised to use much more electricity is coming right around the corner. Additionally, Vietnam is one of the few countries whose rail usage has not increased, and instead stayed rather flat over the years. This is due to a massive underinvestment in rail transport for freight and passengers, and also due to the economic development in Vietnam measured by road usage rather than rails. This is due to Vietnam's geographic features, as a thin but long country. While rail volume cannot be relied upon as an effective metric to measure the Vietnamese economy, it regardless is a huge growth sector that has so far been largely unexploited. See the image below to see the striking difference between road and rail usage in Vietnam. Regardless, road usage is still a strong and reliable indicator of the real Vietnamese economy- road usage has jumped 37% from 2008 to 2012. Vietnam finds itself also with equivalent risks that pair with the immense opportunities facing a country to position remarkably well from China's shift away from manufacturing. Indeed, China is already not a country with manufacturing as its primary driving factor, and as this trend continues, Vietnam will continue to capture remarkable gains by being an effective alternative to Chinese manufacturing. Vietnamese financial services are also in the nascent stage, and will be able to benefit from financing the massive development still needed in the country. Vietnam however does not face benefits without massive risks that come with the gift of manufacturing. With increased manufacturing capability comes an increasing need for electricity and natural resources, and this is where China has put Vietnam in a very difficult situation. Just as Vietnam needs more energy than ever before, it simultaneously faces a risk of a significant percentage of its revenue cut off due to China's nine dash line in the South China Sea. This affects not only projected future revenue from prospective sources in the waters along Vietnam's coast, but also affect current production, as an interpretation of the nine dashed line renders parts of Vietnam's largest oil production fields effectively renationalized as Chinese. Vung Tau is a seaside city in Southeast Vietnam only a couple hours drive from Ho Chi Minh City. 62 miles southeast of Vung Tau sits the Cuu Long Basin, Vietnam's #1 petroleum source in the country. With the enforcement of the South China Sea as one of China's planned objectives, we can see from China's previous enforcement of the South China Sea nine dashed line that an Indian ship, the Airawat, was harassed by the Chinese navy only 51 miles from the Vietnamese coast, and the Indian ship was told it was entering Chinese waters at that distance. That poses a problem when Vietnam's Cuu Long Basin, the primary source of oil production for the country, is situated outside that 51 mile marker at 62 miles away from Vung Tau. A map shown below clearly illustrates how China's enforcement of its waters at a 51 mile marker off other nation's coasts poses a very significant threat to Vietnam's oil production. This is occurring at a point when Vietnam is facing stagnant and/or declining oil production over a decade timeline just as its oil imports are rising to fuel its equally rising economy. Vietnam thus needs to solve this manner in a way that it can safeguard its national interests. Just as Ukraine is more important geopolitically to Russia than the United States, surely the Vietnamese coast and its oil production is more geopolitically important to Vietnam than it is to China? Notice how closely nestled the Cuu Long Basin is to Vietnam, and yet it very well may be included within China's nine dash line. 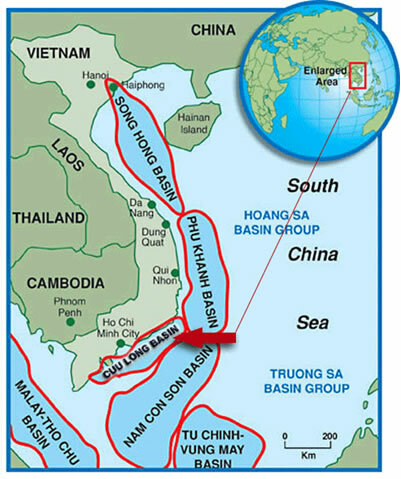 What does that say for the other oil basins of Vietnam sitting even farther away from Vietnam's coasts? That is a staggering amount of revenue that could be potentially renationalized as Chinese assets. This is why the East Sea/South China Sea issue is so core to Vietnam, and sure to engulf Vietnamese politics and finance for some time to come. Vietnam sees itself having a front seat to the fiery ring of South China Sea geopolitics at a time when Vietnam is taking market share in manufacturing from China, and in this process, an entirely new world has been created in Southeast Asia. According to Vietnam Customs Data, Vietnam now exports more to Cambodia, or Thailand, than it does exporting to Spain, or France, or Italy! A further story of how the world is evolving lies in exports to Cambodia. Thailand has nearly 5 times the population of Cambodia, yet little Cambodia imports roughly as much Vietnamese goods as Thailand does! Let that sink into your head. Cambodia is still sometimes considered the poorest country in the world not even touching $1000/yr in GDP per capita, yet it is importing more Vietnamese goods than developed countries such as Spain, France, or Italy is doing. This is yet another sign that Southeast Asia is transforming itself into a veritable market force in the world. In the latest Squawkonomics interview with Marc Faber, he summarizes the Vietnamese economy as in “remarkably good condition”, and goes on to reaffirm that the fundamentals of the Vietnamese economy and the valuations for Vietnamese stocks are very good. I agree with this assessment, but I wonder how attractive the valuations for the energy sector would be if China presses forward on its nine dash line decree. If Vietnam is able to handle the territory disputes with its neighbors, it will be able to secure the Cuu Long fields it currently controls, and be able to expand its oil production along its eastern coast , coming to terms with China on joint usage in the East Sea/South China Sea. This will be the ideal solution for Vietnam. The problem arises if China feels antagonized enough by Vietnamese actions to enforce those 45 nautical mile warning shots at Vietnam's borders beyond simply fishing areas, and targets the renationalization of Vietnamese oil fields within the nine dash line, designated as Chinese fields. Actions designed to raise the ire of Beijing may backfire if Ho Chi Minh loses a significant chunk of its oil production. Therefore, dialogue designed to reduce and not increase tensions is the most beneficial move for the oil-thirsty Vietnamese economy. Vietnam risks becoming a nation suddenly with sharply reduced oil production capabilities if China moves forward on the enforcement boundaries of what it perceives as the nine-dash-line surrounding the Vietnamese coast. This will have massive ramifications for Vietnamese energy companies, and essentially erect a developmental wall that Vietnam will hit if it does not solve its current political and energy resource crisis. Despite even Vietnam's energy production capabilities being severed by the Middle Kingdom in the event of geopolitical rumblings, the events in the South China Sea only serve to slow down and not reverse the process of economic development in Vietnam. So despite the risks of a protracted period of increased tensions with China over the South China Sea, as Marc Faber said, it does not drastically affect the otherwise upward trajectory of the Vietnamese economy in the mid term and long term going forward. It just may take investors a little longer getting there in the process. Keith Hilden holds a degree in Economic Crime Investigation and has CFE training. He is an Asia Pacific markets and Cyber Security Researcher for geopolitical consultancy Wikistrat, and researches frontier markets in developing countries and digital currencies on Squawkonomics. Squawkonomics is focused on delivering multi-dimensional media and business intelligence products on emerging and frontier markets, to assist companies with their market entry strategy and market research needs. Employing a team of capable analysts, Squawkonomics provides first-hand business insights from the best sources and synthesizes them into perspectives that understand markets like never before. Currently based out of Taipei, Taiwan, and with operations in Thailand, China and Canada, Squawkonomics offers an unparalleled glimpse into a whole new economy. Contact us on Twitter, Facebook, or info@squawkonomics.com.